The Church’s silence on refugees has been a contributing factor to the decline of Christianity in the Middle East, the General Bishop of the Coptic Orthodox Church in the UK said today. 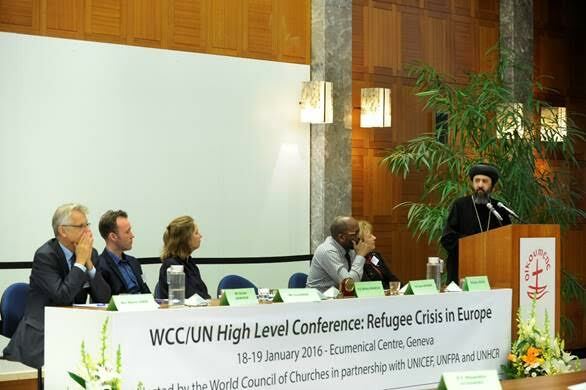 His Grace Bishop Angaelos addressed a conference hosted by the World Council of Churches and the UN to speak of practical ways leaders can respond to the refugee crisis. He joined a number of other church leaders to highlight the mass exodus of Christians from their homeland in the Middle East. “Where there was once a 25 per cent Christian population in the Middle East it is now around 5 per cent, and tragically 4 per cent of those 5 per cent are in Egypt,” he said. “Our silence as Churches, nations, and as a world community, has been a contributing factor to this,” said Angaelos in an impassioned plea. He called on the Church, as “the largest NGO in the world”, to work “in collaboration” in responding to this situation. Christians are not registering as refugees in UNHCR camps and a result “become doubly disadvantaged: persecuted for their religion, Christian or otherwise, and then also by not having equal access to international schemes”, Angaelos said, reiterating a point he has made a number of times in the past. “We need a unified and unifying approach, to work collaboratively and to understand that we have a role and responsibility to act.